Coppicing is the ancient craft of cutting trees in rotation back to ground level with the intention of protecting the re-growth from grazing animals and encouraging the growth of many straight strong stems for using in a variety of crafts and in gardening, building, farming, fencing, charcoal for smelting and wood fuels. Rural Skills Training's standard two day course on coppicing and coppice craft provides the practical skills and confidence necessary to manage coppice woodland and begin converting coppiced materials into useful products. The techniques and principles of coppicing are introduced to participants along with the wider considerations and knowledge of different trees, woodland types, rotations, and various conservation goals. This course will allow you to develop woodland management, coppicing and coppice craft skills for use in your own woodland, garden, farm or croft or as the basis for carrying out coppicing operations in a work environment. 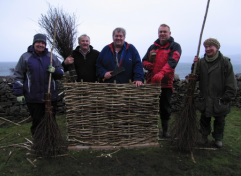 Rural Skills Training also offers training in specific coppice crafts such as hurdle making, woodland management and bespoke courses to meet your needs.